Join us in supporting refugees. Once you have signed in we will add your company or organization name (or logo), with a link to your homepage, to the declaration page. 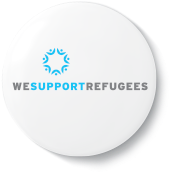 We Hire Refugees will also make available the selection of badges below so you can show your support on your website, social media or workplace.